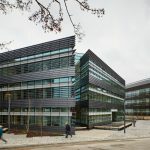 The Big Data Institute (BDI) is a 7,500 m2 medical research building, dedicated to analytical research of the causes, consequences, prevention and treatment of disease. 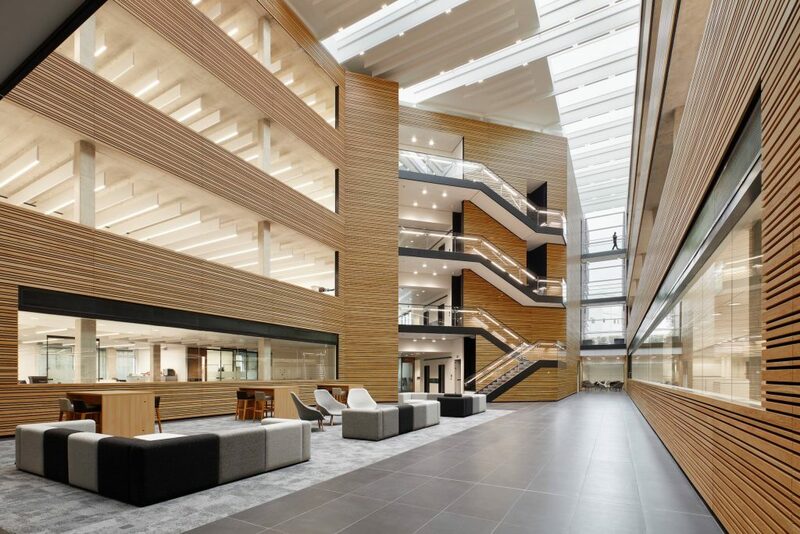 The building, designed by Make Architects for the University of Oxford, has space for over 550 people. The researchers process enormous amounts of data and aim to provide insights into a wide variety of illnesses and treatments worldwide. The large server room currently provides enough computing power for 600 trillion operations a second. 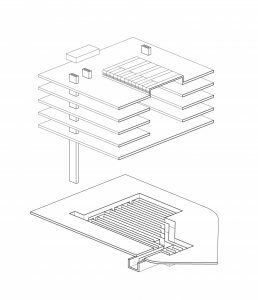 Despite the heat generated by all this activity, the building uses an assisted natural ventilation strategy including a concrete ‘labyrinth’ beneath the building through which exterior air is drawn in, cooling or heating it using the thermal mass of the ground. Make architects designed the building to sit above the 600m underground concrete labyrinth. 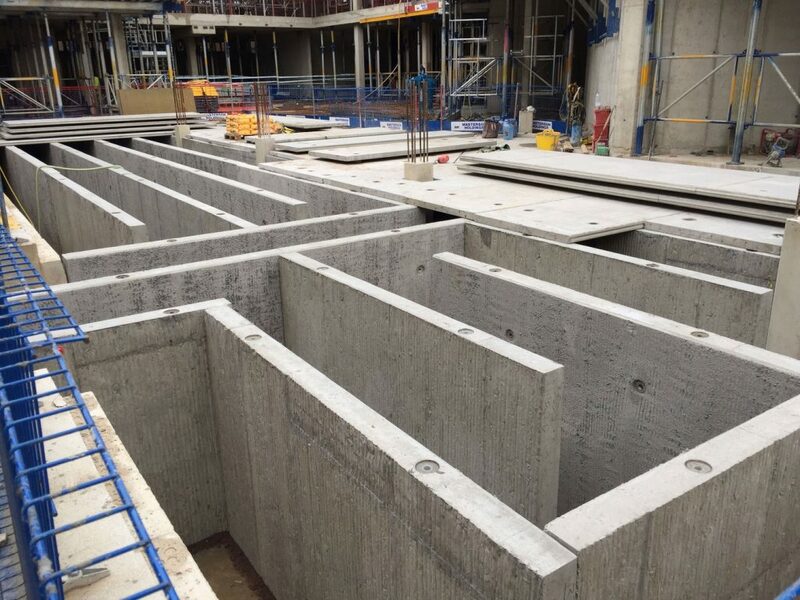 The air running through it is drawn from outside and will either be cooled or warmed by the concrete – which is a relatively constant 12oC – to regulate temperatures in both winter and summer. 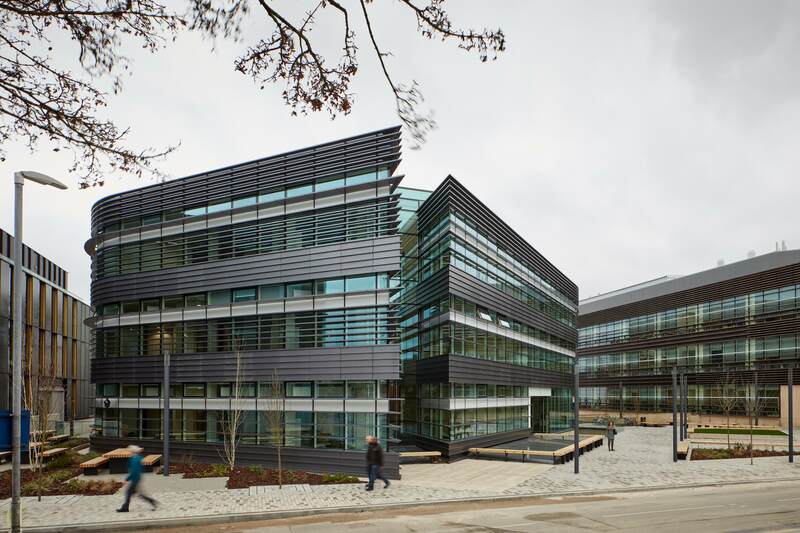 It is the first time this strategy has been used for a research building in the UK. 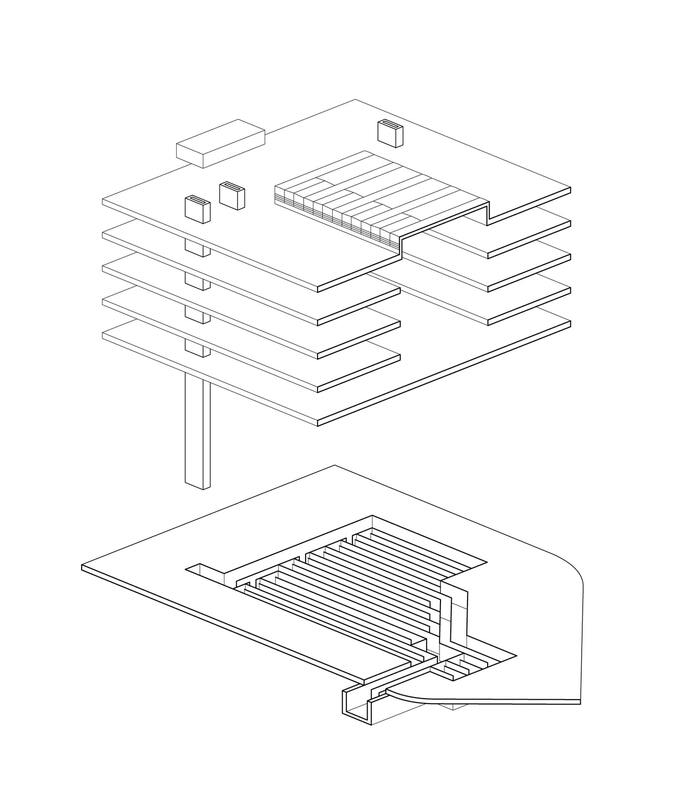 Additionally, the thermal mass of the building itself is used as a sink to provide cooling throughout the day. 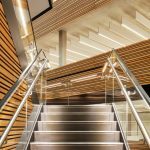 Spectral’s Blade, combined acoustic and lighting system, was chosen as it is specifically designed with thermal mass systems in mind. “The idea to use Spectral lights and baffles came out of the early design decision to have exposed unpainted concrete soffits to benefit from the thermal mass. 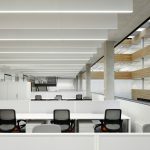 This meant we needed to explore design solutions which suspended luminaries and acoustic baffles to work with the concrete soffit – preferably vertically, rather than horizontally, to keep the aesthetic. The acoustic consultant suggested that we look at the Spectral light and baffle solution. 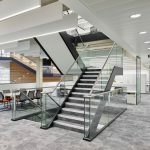 Working together with Long and Partners and RES, our preference was to have both lights fittings and baffles as continuous elements that align with the datum of the suspended ceiling to the circulation areas. The setting out was thus based upon a grid of 750mm to allow future flexibility in layouts, should the client wish to subtract or add perimeter cellular offices. When Spectral was appointed, we worked together as a team to develop a solution of connecting the fittings together, including issues of alignment, cable management and integration of PIR. Thermal mass systems only work with large surfaces of exposed concrete which can absorb excess heat during the day and then release it at night. Conventional ceiling systems and luminaires cover the concrete surfaces and reduce the thermal efficiency. 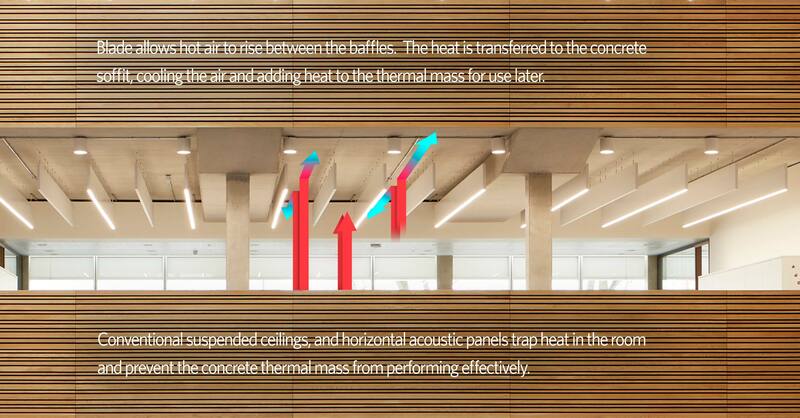 Blade’s vertical baffle arrangement allows warm air to rise between the units and make contact with the concrete surfaces. 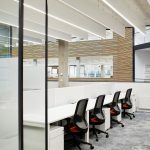 The acoustic baffles reduce reverberation times within the space, which otherwise would be overwhelming for staff with so many exposed hard surfaces. 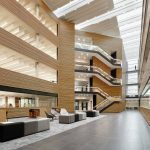 While thermal management of the building was one priority, the efficiency of every system was considered. 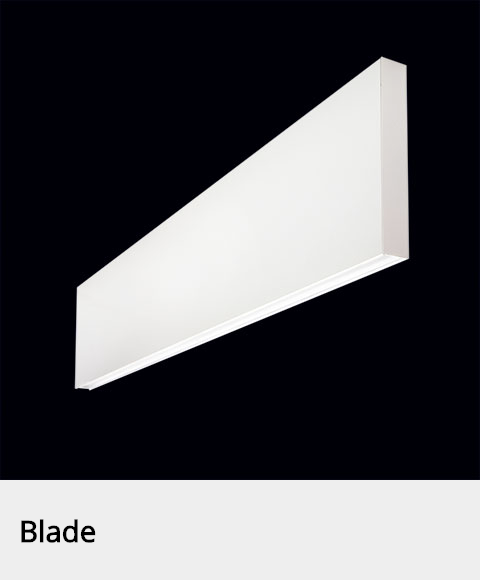 Blades highly efficient LED light engines mean lower electrical load and heat. For this project, the Blade light baffles were specified with DALI dimming and were integrated into a sophisticated control system. 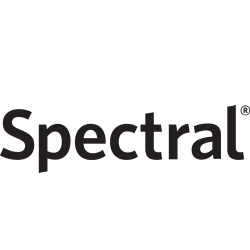 At Spectral, we worked closely with the electrical engineers, Long and Partners over a number of years in preparation for the project. We made a number of modifications to the standard Blade product to fulfill the design brief and especially to make the installation trouble free. In order to make installation simpler and to ensure that wiring faults did not slow down progress the Blade lighting baffles were supplied with plug and socket modular wiring connectors from the factory. 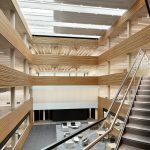 In addition the movement and daylight sensors for the lighting control system were also integrated into the luminaire – ensuring the ideal placement of the sensors and ruling out any problems due to incorrect wiring on site. Finally the emergency lighting was part of the Blade system, with EM-Pro addressable emergency unit being used, allowing centralised testing and reporting. 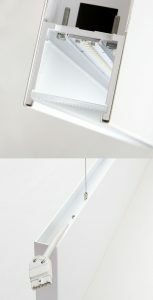 Blade is suspended on easily adjustable wires – the clutches are hidden in the cable tray at the rear of the luminaire -and now uses a magnetic coupling feature for joins and end caps. While very much a functional building, the interior architecture is still striking. The project is one of the first to use Blade II which allows for a visually continuous ribbon of light. While, when the lights are off, the light baffles replicate the pattern of the acoustic baffles.